Guest curated by Swiss curator Barbara Polla, in collaboration with Olivier Varenne from Mona and Dr Mary Knights from TMAG, A Journey to Freedom explores issues relating to incarceration from a range of different cultural and historical perspectives: from Tasmania’s dark convict past, to doing time in the notorious “Pink Palace” Risdon Prison and the experience of refugees held in camps and detention centres in Australia and beyond. The exhibition brings together new and recent works by contemporary national and international artists working across installation, sculpture, video, photography and virtual reality, with works presented across the museum’s temporary galleries and transitional spaces. International artists include Janet Biggs, Nicolas Daubanes, Mounir Fatmi, Joana Hadjithomas and Khalil Joreige, Ali Kazma, Rachel Labastie, Robert Montgomery, Jean-Michel Pancin and Jhafis Quintero. Australian artists include Shaun Gladwell, Sam Wallman and well-known Tasmanian Ricky Maynard. In developing the concept for this exhibition, Ms Polla noted that "imprisonment and freedom are two faces of a double sword…any exploration of imprisonment is, by itself, a journey to freedom". "I am delighted to have the opportunity to work with Barbara on this exciting new exhibition given her long standing interest in human rights,” Dr Knights said. "It is fantastic to be able to bring contemporary artists from Australia and around the world together to present a range of thought-provoking works at TMAG, providing audiences with the opportunity to reflect on the nature of imprisonment at both a personal, local and global level. "I am particularly excited that French artists Rachel Labastie and Nicolas Daubanes as well as Australian artist Sam Wallman have created new artworks on-site at TMAG especially for A Journey to Freedom." TMAG Director Janet Carding said that TMAG was proud to partner with Dark Mofo and Mona on this exciting new exhibition. “A Journey to Freedom is a great example of how by positioning ourselves as a partner of choice, TMAG is able to collaborate with major festivals and other cultural institutions to deliver a dynamic program of activities year-round that provide a premium visitor experience for both local audiences as well as visitors to Tasmania,” Ms Carding said. A Journey to Freedom opens with a special free late night opening event from 6:00 pm until 9:00 pm featuring a performance by Tasmanian sound artist Matt Warren. Additional late night openings are programmed throughout the festival period from 15-17 June and 21-23 June. The exhibition continues at TMAG until 29 July. 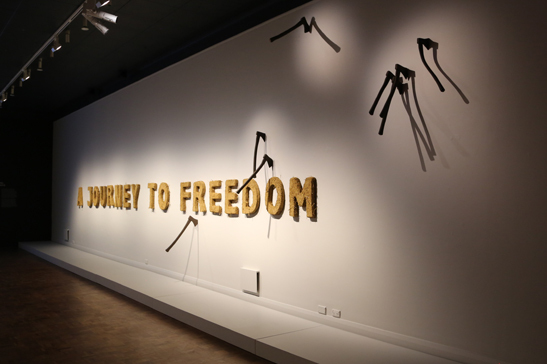 A Journey to Freedom opens at TMAG on Friday 8 June 2018 with a late night opening from 6:00 pm – 9:00 pm. There will be a special public holiday opening on Monday 11 June, 10:00 am – 4:00 pm. During Dark Mofo, there will be late night openings until 9:00 pm from 15-17 June and 21-23 June. The exhibition continues Tuesday – Sunday, 10:00 am – 4:00 pm until Sunday 29 July. (top) Works by French artist Rachel Labastie, including one work created on-site at TMAG. Work details: Rachel Labastie (b. 1978), Axes, 2017, 6 ceramic components, on loan from the artist, and A Journey to Freedom, 2018, clay, sand, straw, commissioned by the Tasmanian Museum and Art Gallery. 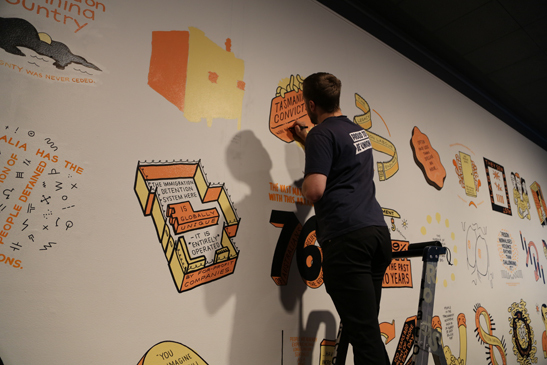 (middle) Australian artist Sam Wallman putting the finishing touches on the work he created on-site at TMAG. Work details: Sam Wallman (b. 1985), Untitled, 2018, paint, pen, pencil, commissioned by the Tasmanian Museum and Art Gallery. (bottom) French artist Nicolas Daubanes with the work he created on-site at TMAG, depicting Port Arthur’s Isle of the Dead. Work details: Nicolas Daubanes (b. 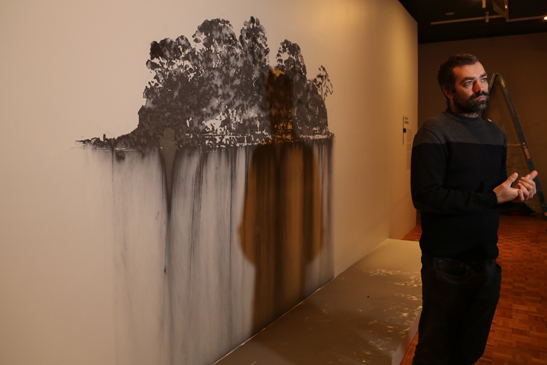 1983), Untitled, 2018, iron filings, magnetic sheets, commissioned by the Tasmanian Museum and Art Gallery.